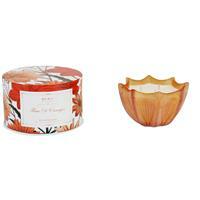 FRAGRANCE: red mandarin, sandalwood, grapefruit, perilla A sharp look at the freshest scents of Summer. Lady Rhubarb evokes sunny afternoons with its balanced and exciting combination of Blood Orange, Red Mandarin, Grapefruit, Sandalwood, and Perilla _ also known as the rare Japanese shiso, which boosts the immune system. This energizing and exquisite perfume is a DL & Company classic. 40+ hours of burn time.